Size 12" x 18" with 4" cope and drag. Weight about 18 pounds per selection. 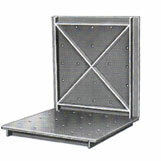 A very popular style 1/4" material with formed flanges and side wall corrugations. End handles, stub pins, bushings and side clamping lugs. Light weight one-man flask, 3/16" walls, 12" x 16" x 3". Each section weighs about 13 pounds. This flask measures 48" x 60" x 12" deep. The Shanafelt corrugated sidewall helps hold the sand as well as stiffen the sidewall. This flask is used successfully without bars. This 18" x 32" flask with 7" cope and 7" drag, weight 470 pounds per set. Designed for automatic molding. Side rails fully machined to very close tolerance. Special machined flasks 20" x 33 /4" x 11" deep, weight 637 pounds. Used on Osborn Molding Unit. Side Rails were machined to tolerance for high speed molding. Many of these flasks are used on a automatic unit in a well known Illinois foundry. Size illustrated is a 28" x 56", 10" deep drag. Weight 855 lbs. A strong, rigid construction for plates of about 30" and over. Here, too, the thickness of plate and reinforcements varies with the load to be carried.